Crowned Heads is a new cigar company, founded by Jon Huber, formally of CAO. After finding himself in the middle of a corporate merger between CAO and General Cigar, Jon went his own way and continued doing what he loved best for most of his life. According to the Crowned Heads website, "Four Kicks is about sticking to your guns, and remaining loyal to those whom you love, and the hometown that brought you to the dance. 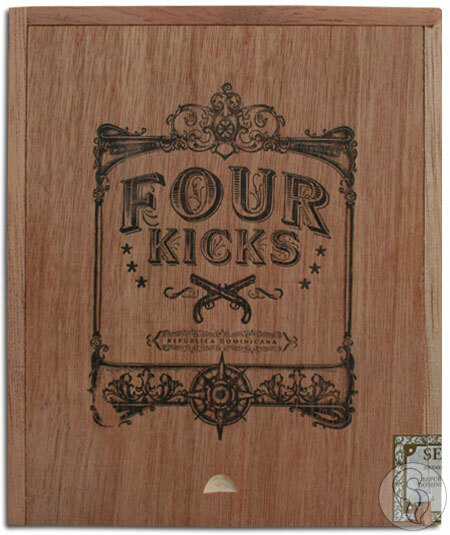 Four Kicks is about turning your back on the corporate machine, and making your own rules." Cloaked in an Equadorian Habano wrapper with Nicaraguan binder and filler, this medium bodied cigar blended and rolled by Ernesto Perez-Carillo is a complex blend of spice and sweetness, with the excellent construction that we've become accustomed to with any and all cigars made by Ernesto. With only 30,000 cigars made for 2011, this highly anticipated cigar will not be on the shelves for too long.